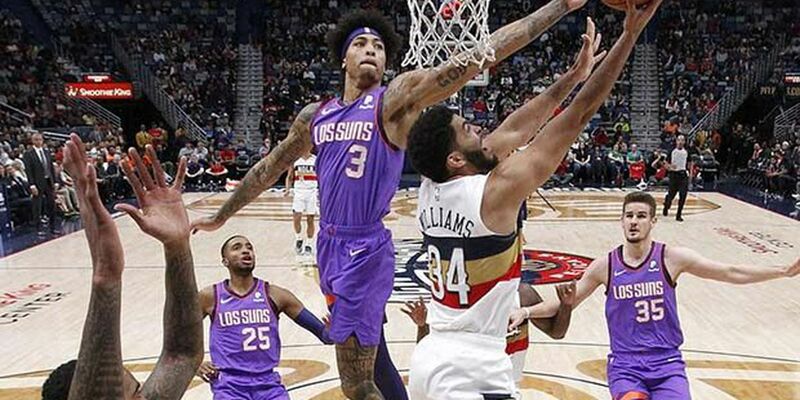 NEW ORLEANS (AP) — Josh Jackson hit a tying 3-pointer with 2 seconds left in overtime, the Pelicans were assessed a technical foul when they called a timeout they didn't have and Devin Booker hit the free throw to give the Phoenix Suns the lead for good in a 138-136 victory on Saturday night. Booker finished with 40 points to go with 13 assists, and Jackson, who had 19 points, scored the game's final point on a free throw after he was fouled on an inbound pass with less than a second on the clock. Elfrid Payton had 16 points, 16 assists and 13 rebounds in his fourth straight triple-double — all coming in the midst of New Orleans' six-game losing streak. New Orleans called its final timeout, leading 136-133, after rebounding Booker's missed 3-point attempt with 7 seconds to go. But when play resumed, Payton was whistled for a 5-second violation while trying to inbound the ball, setting up Jackson's game-turning 3. Anthony Davis, who scored the game's first points on an alley-oop dunk, had 15 points, 11 rebounds, three steals and a block in 22 minutes for New Orleans. The Pelicans trailed 80-75 when Davis left the game for good with 5:15 left in the third quarter, in line with his scaled-back playing time since his trade request in late January. New Orleans' overtime collapse came after the Pelicans also missed a chance to end the game in regulation. After Booker's layup tied the game at 122 with 18 seconds left in the fourth quarter, the Pelicans called timeout to set up the last shot, but Frank Jackson's fade from the top of the key fell short. Suns: Deandre Ayton was ejected after being assessed his second technical foul of the game with 1:02 left in the third quarter. Official Eric Lewis assessed the second technical while Ayton complained from the bench about a foul called against him moments earlier that had led coach Igor Kokoskov to substitute the starting center out of the game. Lewis later called a technical on Oubre for arguing a call in the middle of the fourth quarter. ... Oubre has scored 22 or more in three of his past four games. ... Oubre missed two dunks, one on a put-back opportunity and another when he miss-timed a flamboyant, left-handed attempt on a fast break and jammed the ball against the side of the rim. Pelicans: Payton joined James Harden, Magic Johnson, Michael Jordan and Russell Westbrook as the only players in NBA history to record triple-doubles in as many as four straight games. ... Darius Miller had 16 points, Jahlil Okafor 15 and Ian Clark 11, all off the bench. Jackson scored 14 and Kenrich Williams 10 in starting roles. ... Cheick Diallo had 10 rebounds. ... Latvian Dairis Bertans played for the third time since New Orleans acquired him as a rookie free agent this month. The 29-year-old, whose younger brother, Davis, plays for San Antonio, scored the first points of his career on a 3-pointer late in the third quarter. He finished with three points and one assist in 10:34 on the court.